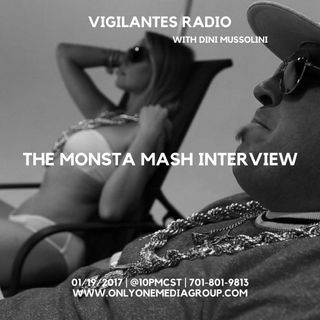 Monsta Mash stops by to chat with Dini Mussolini about his latest releases & why he's been away so long! Set your reminders, because it's happening! 01/19/2017 | @10PM CST | dial 701-801-9813 | or via the browser by visiting www.onlyonemediagroup.com/vigilantesradio and slapping that "Go Live" button. Monsta Ma$h is a pop ... Maggiori informazioni punk rapper with 33 years of stage and recording experience who commands a stage like nobodies business. With three new singles released for Christmas 2016, Mash is quickly earning the respect of the Santa Barbara community, Southern California's music scene and the music industry, already talking to several major record labels after performing one sold out show in Inglewood, California with none other than Snoop Dogg's famous Dogg Pound Gang of the 213. Esplicito The Monsta Mash Interview.